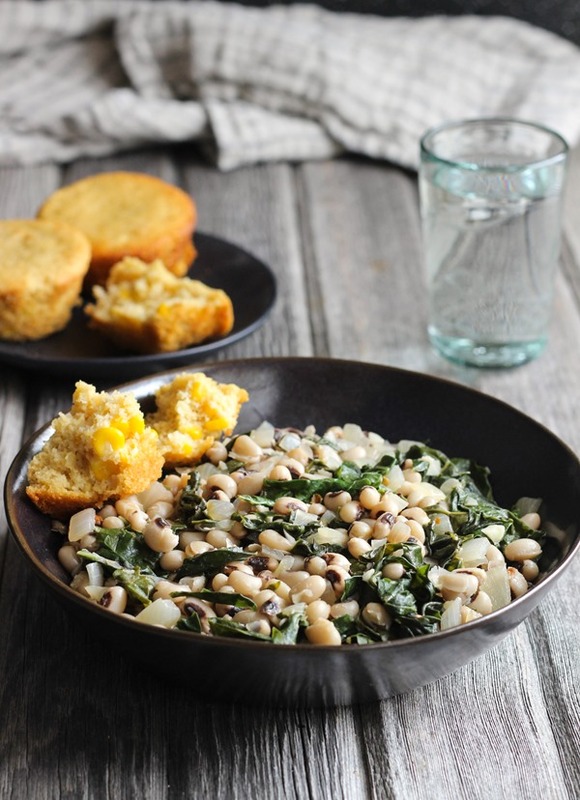 To start your year off right, a little Southern Tradition: Black Eyed Peas for good luck and greens for fortune. Here’s to a happy and healthy new year! Soak the black eyed peas for at least 6 hours by placing them in a large bowl and adding several cups of water (I use filtered water) so that they are covered by a few inches. Drain and rinse them then add them to a pot with 3 cups of water and bring to a low boil. Cook for about 30 minutes, until tender but not mushy. Drain and set aside. In a large skillet, warm the olive oil over medium heat. Add the onion and cook for 2-3 minutes then add the garlic and cook for another 2 minutes. After you have washed the greens, removed the stems and roughly chopped them, add them to the skillet along with the 1/2 cup broth and cover with a lid. Cook them for 10 minutes, lifting the lid to stir them every couple of minutes.